Powers/Abilities: Without armor Soames was a normal human. The armor was made of a molecular-scale woven metal fabric. It provided remarkable protection from physical attacks and incredible protection from energy attacks, including heat and cold. The armor possessed a solid state 600 watt laser cannon mounted in the right arm assembly which was capable of slicing through three inches of steel alloy in .04 seconds. The secondary weapon was the 400 watt electron particle gun also mounted in the right arm assembly. 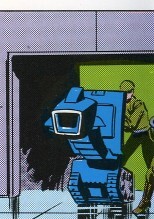 This weapon’s plasma column was generated by the main laser cannon in a short duration pulse mode. In the left palm a high-frequency, extreme short range electric shocker was implanted. The armor's wearer was isolated from the electrical energy created by the armor. To enable flight the armor possessed electric, air-breathing turbines set into the calves. Maximum speed of the armor was Mach 1.6 and it could reach heights up to 80.000 feet. Internal life support system could maintain the wearer for 3,5 days in hostile environment. While the life support systems may allow survival in deep space or underwater, certain suit systems would have been affected such as the air-breathing turbines that allowed flight. Weight: (Without armor) 165 lbs. History: (Daredevil I#167 (fb) - BTS) - Aaron Soames worked for 35 years at Cord Conglomerate as archivist. When Cordco digitalized the archives using computers, the 63 years old Soames asked for his pension, but he discovered that one of the computer programmers had deleted his file. Edwin Cord denied pension to Soames. Further delusions arrived when Soames tried to obtain the social pension, and again when he tried to ask for justice by hiring a lawyer. Deeply disappointed, Soames, determined to punish Edwin Cord, stole the Mauler suit, an armor and a weapon, developed by Cordco for the US Government. (Daredevil I#167) - During a party at Cord's house in Forest Hills, Mauler tried to kill Edwin Cord. He was distracted by Arlo, Sammy and Cord's other bodyguards, but easily slapped them away. Their distraction gave Matt Murdock the time to put on his Daredevil suit and attack Mauler. Daredevil avoided Mauler's blasts but finally Mauler grabbed him and shocked Daredevil with his electric glove. The Police arrived on the scene and Mauler flew away. The next night, Soames reached the Cord Conglomerate HQ in Long Island, defeated some guardsmen and reached Edwin Cord but Daredevil arrived just after him and stopped him again. Mauler and Daredevil tangled while Cord ran away. Daredevil managed to have Soames confess his reasons but other Cordco guardsmen interrupted them. Mauler destroyed the lights and escaped in the darkness, reaching Cord. Mauler took Cord's credit cards, identity cards, driving licence and all the documents that confirmed Cord's existence and burned them, as an act of vengeance. Soames was leaving when two guardsmen hit him with a powerful, lethal blast with a Vibro-Mace that killed him. Comments: Created by David Michelinie, Roger McKenzie (writers), Frank Miller (pencils), Klaus Janson (inks). Thanks to Omar Karindu for the Daredevil I#172 information. Mauler (Soames) has an entry in OHotMU Deluxe Edition#18. The Vibro-Mace was one of the several weapons developed by Cord Conglomerate. It shot a concentrated ray of unknown energy, powerful enough to pass through the incredibly protective Mauler armor and was installed over a moving base. 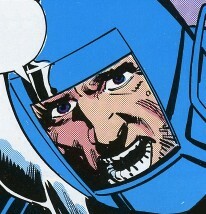 (Daredevil I#167) - Earl, one of Cordco's guards, used the Vibro-Mace against Mauler while he was distracted. One shot was enough to lethally wound Soames who died a few seconds later. (Daredevil I#172) - Bullseye and a number of mobsters in the employ of former lieutenants of the Kingpin (Wilson Fisk) breached Fisk's underground hideout using a Vibro-Mace, but the Kingpin had already abandoned the lair.